12/04/2018 02/20/2019 - by Liam Weisman - 4 Comments. With the Lenovo Ideapad 330 series, Lenovo offers a variety of hardware options but all with a common budget price denominator. The configuration ranges from $300 to $1000 depending on the model. The configurations also differ, from the processor, memory capacity, storage space, and graphics card. You’ll find units ranging with the simplest processors to the powerful Core i3-8130U/Core i5-8550U, all designed to keep up with your workloads. Our review unit composed of a bunch of the somewhat high-end specs. It brags of an Intel Core i3-8130U processor, Integrated UHD graphics 620 GPU, 8GB of RAM(2400MHz) and 1TB hard disk storage. Other specs include the not-so-glamorous 1366 x 768 TN panel display, but you can opt for a configuration with Full HD (1920 x 1080) display. The components are rather modest with the processor being a mid-tier kind of CPU. On the bright side, there are several other laptops with the same processor with similar pricing and components. Let’s see how the Lenovo Ideapad 330 performs and compares. It should be an interesting find for prospective buyers. 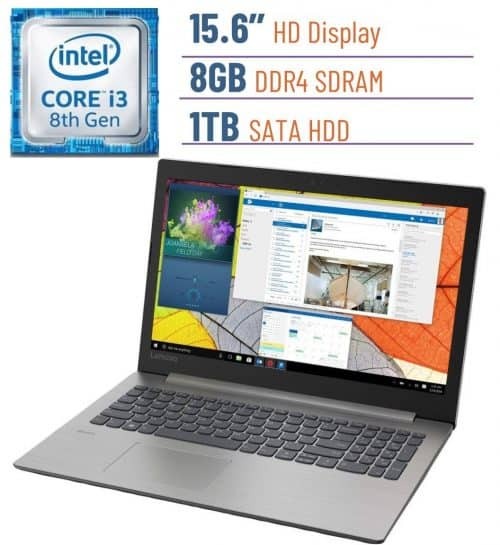 The Lenovo Ideapad 330 series with its wide range of configurations represent the budget productivity laptops for day-to-day computing tasks, web browsing, handling MS Office and other productivity software. It’s reasonable pricing, toned down aesthetics and middling performance makes it a great choice for home and office work. For me, productivity is achieved through a number of facts, in this case, specifications. And one of the most important is display size. I love myself plenty of screen estate to work with because bigger screens allow you to open a couple of windows, all at once, and multitask easily as well. Our reviewed unit came with a 15.6-inch display, which is plenty, but there is also a 17-inch option available, and a 14-inch if you’re contemplating on going smaller. The display on this baby is a 1366 x 768 on a TN panel. To be honest, with laptops in the past few years getting faster, lighter and cheaper, it’s unfortunate to find that some still have this resolution. The industry standard for laptop display in this day and age is nothing less than 1920 x 1080 which allows you at least 1080p video experience. This is one of the caveats about the Lenovo Ideapad 330 which means you will have to entertain lame 720p video, poor viewing angles and washed out images. Also, the brightness is on the low end of the spectrum. Using this laptop under sunlight would not be advised and if you’re one who reads web pages, edits documents or multitasks, then doing that indoors would be better. I use a Dell Inspiron i3179-0000RED laptop with the same resolution and often notice the graininess when watching movies or reading texts. But I’m fine with it. There’s a solid selection of ports on the left side of the laptop. You get a full-sized HDMI for external monitor connections, an Ethernet port for LAN internet connections and two USB 3.0 ports (with one charging). There’s a single USB-C port but unfortunately, it can only be used for data transfer and not display-out or charging as is usual. Quite honestly, it is a bit frustrating that Lenovo limited the USB-C’s functions by reserving some of its functionality. Moving on, there’s a 4-in-1 card reader that supports SD, SDHC, SDXC, and MMC cards and a 3.5mm audio microphone/headphone combo jack. On the flip side, the right side has a DVD drive, a rarity in modern laptops. Alongside it is a Kensington lock slot for securing your machine to the table. Other notable connectivity options include an 802.11ac Wi-Fi and 4.1 Bluetooth. You might need to upgrade in the future so getting access to the hood is essential. For this, you’ll need a screwdriver to loosen the 15 screws underneath the laptop. Turning the underside reveals the two downward firing speakers and the vents. The base is supported by four grippy rubber stands that keep it from sliding off the table while in use. If nothing impressed you, then the performance of the Lenovo Ideapad 330 will, being that it’s the main appeal of this laptop. 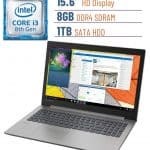 For almost the same price, you get a processor used by the very best industry laptops such as the Lenovo ThinkPad T480 (uses the same processor but Quad-core, named Intel 8250U), Dell XPS 13 9360, Acer Spin 3 and Asus VivoBook S S510UA-DS51. It uses the 8th Generation Intel Core i3-8130U processor, coupled with 8GB DDR4 memory and 1TB 5400RPM storage. The Ideapad 330 shines thanks to the Intel Core i3-8130U is a mid-tier processor made as a solution for day-to-day computing tasks. I mean, web browsing, working MS Office and other productivity software, watching movies or simply streaming Youtube videos. It is the base model of Intel’s 8th gen processors, so it won’t handle extreme tasks. For demanding tasks such as video and photo editing, the 8th Generation Core i5 and i7 make a better choice. Again, the Dell XPS 13 9360, Acer Spin 3 and Asus VivoBook S S510UA-DS51 are great examples of Intel Core i5 8th generation processor laptops. As for storage, there is plenty of hard drive storage. The one caveat you will have to contend with is the slow spindle 5400RPM speed it comes with. This is one of the pitfalls that laptop manufacturers secretly use for unsuspecting clients. They know that most buyers are looking for long battery life, large amounts of storage, affordable price, and slim chassis. The large storage is mentioned rarely with no specifics to captivate the unsuspecting eye. And it works, more often than not. Fortunately, for Lenovo, they have mentioned the 5400RPM on their Amazon store supplier section and on their website. Thankfully, you can add a Solid State drive on this laptop and it will take off. You’ll thank me later when your booting and multitasking work like a charm. If you’re committed to upgrading, the available DVD drive can also be swapped for a Blu-ray drive. P/S In order to swap it, you have to remove the pack panel too which means unscrewing the 15 screws with a flat head screwdriver. To sum up performance, if you’re coming to the Lenovo Ideapad 330 from a laptop with a discrete graphics card, you might not like the whole experience it brings to the table. That’s true, especially for gaming. However, for users who are using it for the first time, the laptop has enough juice to play video without any unnecessary jitters or lags. Battery life is not as impressive but it does add up to what Lenovo promised. You get 3 hours 20 minutes of battery life and mostly so when not running heavy applications and keeping the screen brightness turned down. The battery is fitted with Rapid Charge technology which allows a fast 15 minutes charge that should last you up to 2 hours of use. Additionally, the battery takes up 65watts of power which by many standards is modest and won’t set you back in electricity bills. For our reviewed unit, the closest alternative that wouldn’t involve changing the pricing as much would be the Acer Aspire E15 E5-576-392H laptop. It offers a Full HD display (1920 x 1080), longer lasting battery life and graphics card. On the flipside, it is heavier (5.27 pounds) and offers 6GB DDR4 memory instead of 8GB DDR4 RAM. The second and slightly pricier option is the Asus VivoBook F510UA-AH51 laptop selling at $510. For the difference, it offers an Intel Core i5-8250U processor which is a Quad-core, unlike our reviewed unit’s Dual-Core CPU. Also, it brags of a security feature, the fingerprint scanner and has Full HD (1920 x 1080) display with anti-glare. It’s a great choice but you would have to part with at least $200 extra. There’s no escaping the fact that the Lenovo Ideapad 330 is a basic computing laptop. It offers an impressively great design for an all plastic finished laptop and a welcome configuration of both size (14,15 and 17 inches), memory and storage. Working with our 15.6-inch display was a joy but we had to get over 1366 by 768 resolution that only allowed 720p video playback. Also, there are plenty of ports to work with on the left side of the laptop which is positive. But not being able to use the USB-C for charging or display-out was very discouraging and could be very for many other users too. The large HDD (albeit slow) storage is worth having for data and media storage but SSD would also be a welcomed advantage. Altogether, for the price the Ideapad 330 sells for and the number of positive on-paper specs, it’s a hard bargain to step away from. Then again there’s the aspect of walking away from a value system that won’t break your bank. Especially when its trade-offs are bearable. I guess for the Lenovo Ideapad 330, it’s a balance of pricing versus performance. If you can look past its flaws, it should serve you well. We recommend it as a budget laptop for your daily home and web browsing computing needs. For business professionals with a keen eye on display and battery life, we recommend checking out the new Lenovo ThinkPad T470 Business laptop.